Certainly without question, the back when fully developed, is one of the most impressive and spectacular bodyparts on the male physique. A well developed back is the symbol of manhood and has been admired and idolized by sculptures and artists for dozens of centuries, dating back to the Greeks, Romans, and my own ancestors, the Egyptians. Examine statues from these early civilizations and the muscles of the back, along with the abdominals, forearms and hands have always been exagerrated and show tremendous development in an attempt to portray the ultimate in masculinity. Certainly without question, the back when fully developed, is one of the most impressive and spectacular bodyparts on the male physique. A wide, thick, highly developed hack is one of the distinguishing features of a good bodybuilder and when a top bodybuilder who has a great back turns around to show it at a physique contest, it brings gasps of amazement from the audience and never fails to impress the judges too. On the otherhand, many a bodybuilder who looked good from the front, lost valuable points or even contests because when he turned to show his back, he showed a shallow, underdeveloped back. 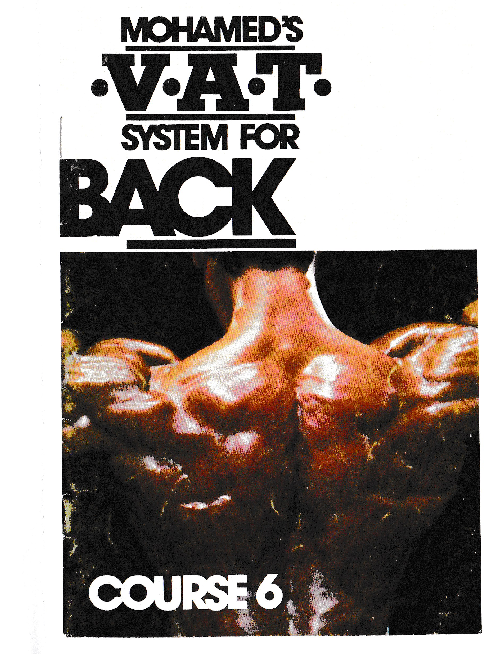 You can bet that nobody ever won a top contest without great back development. You can sometimes get away with less than ultimate development in the calves, thighs, abs, pees and even arms, but never the back. In fact, in my mind, the muscles of the back, along with the abdominals and deltoids, can never he overdeveloped. I’ve seen various bodybuilders with arms too big, thighs too big, and pets too big, but never have I seen someone with too much back, abs or dell development and I doubt if I ever will. To say then that the back is one of the most important muscle groups in the body would be an understatement. There arc many, many reasons why you should strive for maximum hack development and not neglect your back like so many do. Physically, if your back lacks width or thickenss, you will look unbalanced, especially when posing. You must always remember that the body is one unit and we cannot just have certain parts developed and ignore others, not it you want to have a perfect physique. Our goal in bodybuilding should always be to develop each bodypart to perfection, with the right amount of size, shape and in proportion to other muscles in the body. At least that is my approach to building a complete and perfect physique and I have always felt that huge muscles slapped carelessly and thoughtlessly onto a body don’t necessarily add up to physical perfection. Fully developed, the back creates the V-shape that makes you look wide and gives you the thickness to look good on all twisting back poses. This wide, sweeping V-taper shows up even when dressed and greatly contributes to overall body symmetry by balancing out the body and by tying together the major muscle groups of the body; the deltoids, pectorals, abdominals, thighs, gluten and neck all tic into the back. Most bodybuilders seem to forget that the back makes up one-third of the total mass of the body, with the legs also one-third and the arms and muscles on the front of the torso making up the other third. Also, the back contains the largest muscles of the tipper body and the second largest of the entire body, after legs.